Last week was a busy one in Washington, D.C. for FIU’s academic leaders, two of which were invited to the nation’s capital to discuss teacher preparation programs and climate resilience efforts. Dinehart shares with other HSI’s how FIU exposes teaching students to communities who lack diversity in the workforce. 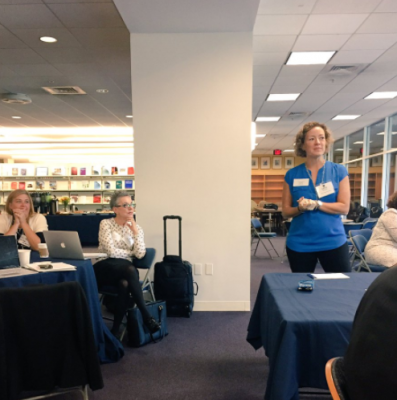 On Sept. 22 and 23, Laura Dinehart, executive director of the School of Education and Human Development, visited the White House and U.S. Department of Education to offer guidance to the administration on its efforts to diversify the teacher workforce. She addressed various questions on the teacher shortage facing the United States and how to get students to become teachers. 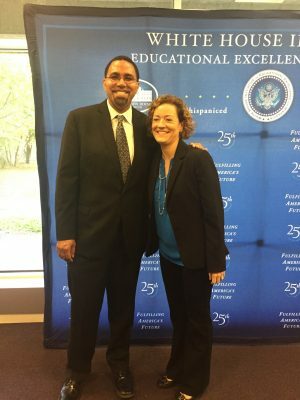 Laura Dinehart with U.S. Secretary of Education John King. “I was surprised to learn that only 8 percent of teachers in the United States are Hispanic. We want to make sure our students get every opportunity to see teachers who are like them,” she said. Dinehart talked about the FIUteach program, which gives students majoring in math, biology, chemistry, physics or earth science the opportunity to receive a secondary teacher certification without adding time nor expense to their four-year degree. She also highlighted the importance FIU places on exposing its teaching students to local diverse communities. Earlier this week, Brian Schriner, dean of the College of Communication, Architecture and the Arts, met with National Security Council Resilience advisers and attended the White House’s National Preparedness Roundtable on Resiliency. The summit took place the day after the White House and the Department of Energy announced that Miami would be included among a network of communities known as the Better Communities Alliance – chosen to address the region’s energy and climate challenges. 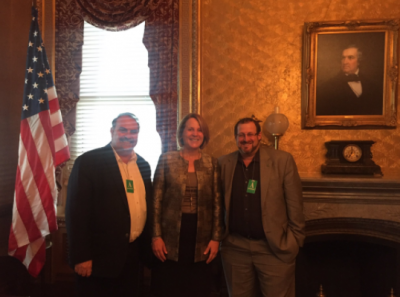 FIU visits the White House to participate in the National Preparedness Roundtable on Resiliency. Miami will also join the MetroLab Network focused on the intersection of big data and human services. Of interest was FIU’s Sea Level Solutions Center, an interdisciplinary center focused on translating FIU research to action by partnering with local municipal and regional partners. As Zika continues to be of national and local concern, the U.S. Senate has approved a spending bill which provides $1.1 Billion in emergency funding for the government’s response to the Zika virus. Herbert Wertheim College of Medicine Professor Dr. Aileen M. Marty, an expert in infectious diseases, has been at the forefront of the local response. On Sept. 26, Dr. Marty was part of a White House briefing that provided the health care community an update on Zika based on the latest CDC findings. 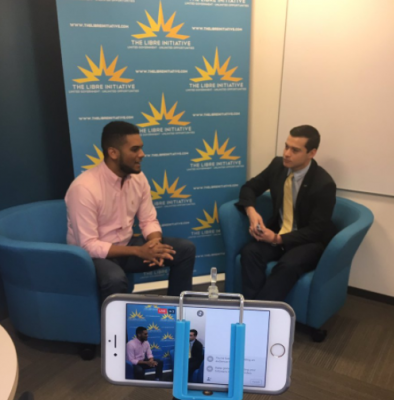 FIU in D.C. (the university’s D.C. office working to advance FIU’s mission and federal priorities) launched the first live “Panthers on the Presidency” episode. In advance of the presidential election, the series features FIU alumni and friends’ perspectives on the race for the White House. This week, alumnus Steven Cruz kicked off the inaugural episode. To watch the episode, click here. The Jack D. Gordon Institute for Public Policy hosted a live professional development webinar on the future of CIA’s workforce. The webinar gave students a look into the CIA recruitment process and career development. Students were able to ask questions virtually and have them answered by CIA recruiting officers. FIU alumni and friends were in attendance at the Hispanic Heritage Awards (HHA) Sept. 23 at the Warner Theatre. The HHA recognizes Hispanics for their civic and artistic contributions. Among those honored at the HHA were Judge Sotamayor, the country’s first Latina Supreme Court Justice; J. Balvin, a Colombian hip hop and reggaetón artist who painted houses and now paints his dreams; and Junot Díaz, author of several books including The Brief Wondrous Life of Oscar Wao – a bestseller. Ady Arguelles, Susan Lane of University Advancement, and former D.C. intern Christin “Cici” Battle, attending the opening of the National Museum of African American History and Culture. For more information on FIU in D.C., visit washingtondc.fiu.edu; call (202) 558-3481; or follow onTwitter, Facebook and Instagram.